Esthetic Line adalah implan berbentuk kerucut yang menawarkan kompatibilitas bedah dan prostesis dengan lini BL implan. Inti implan EL adalah sama seperti inti implan BL dan dengan demikian mengikuti protokol penyisipan yang sama dalam tulang lunak. Implan EL implan memiliki alur apikal yang baik yang memberikan stabilitas primer yang luar biasa, terutama di tulang lunak. Sambungan prostesis implan EL adalah sama dengan BL, sebuah koneksi penguncian lancip Morse yang memberikan peningkatan tingkat keamanan terhadap abutment longgar, pergerakan mikro dan masalah lain yang merupakan akibat dari celah koneksi implan. System prostesis gigi perubahan landasan, Konsep Estetik Cekung dari sistem implan EL menawarkan berbagai macam pilihan serta kemungkinan membentuk jaringan. Meskipun terdapat berbagai macam kebebasan prostesis, sistem tersebut tetap tidak rumit dan mudah digunakan karena faktanya koneksi prostesis adalah sama untuk semua diameter implan. Implan gigi Narrow Diameter adalah implan dua buah bertubuh ramping dengan diameter landasan hanya 3mm. Implan ini sangat ideal untuk ruang puncak terbatas dan sempit di daerah anterior. Dilengkapi alur yang baik pada tubuh implan, yang berpuncak pada alur tajam di puncak yang memberikan stabilitas serta kemudahan penyisipan. Protokol bedah sederhana dikombinasikan dengan dimensi konservatif implan gigi ini memfasilitasi penyelesaian kasus implan gigi yang akan memerlukan pembesaran tulang yang digunakan dan biaya perawatan yang lebih tinggi. - Facilitates bone growth above the shoulder. - Long term implant stability. - Biological repartition of the forces in cortical bone. - Softens forces to the cortical bone during insertion . - Best surface for osseo integration and bone to implant contact. - Ideal for immediate implant placement. - Protection of the sinus floor, nerve canal and other important anatomical structures during insertion. - Insertion rate of 1,5mm per rotation. Implan gigi Gingival Level adalah implan berbentuk kerucut dengan koneksi heks internal. Implan ini memiliki kerah beralur mikro untuk pemeliharaan kortikal dan dimahkotai dengan rim poles untuk mengakomodasi jaringan lunak. Implan gigi ini memperoleh manfaat dari landasan heks internal yang cembung yang memberikan segel ideal ketika digabungkan ke batasan GL yang pada gilirannya memiliki landasan berbentuk cekung. Implan kisaran GL memiliki dimensi platform yang sama meskipun berbeda diameter dan dengan demikian memungkinkan untuk protokol prostesis sederhana. The convex implant platform, in conjunction with the concavity of the implant’s base form a “suction cup” fit, once the abutment is tightened into final seating. Extending down for one millimeter down from the top of the implant platform, the polished surface is ideal for accommodating the gingival tissue. The micro threads increase functional surfaces, adapting them to the compact cortical bone tissue and safeguard it against aggression from larger threads to be found in conventional implants. The micro-threads are essential to the maintenance of cortical bone height around the implant. The complete GL family is endowed with a single connection. Independent of the implant diameter, one abutment fits all. Thus reducing system complexity and cost. The double-helix design sets c-tech Implants apart from the single helix implants by giving them a more symmetrical introduction into the bone. This translates into masticatory load balance which drastically reduces stress. Its symmetry also renders the implant self-centering, eliminating any form of misalignment in terms of the main axis of the osteotomy site. The pitch of the threads allows for an insertion time that is reduced by half. The implant surface is blasted with aluminum oxide and then subjected to progressive etching using citric acid. This surface treatment accelerates the osseointegration process by providing a greater and more uniform area of contact between bone and implant while favoring an immediate implant load. The treatment provides for a uniform surface with progressive trabeculation to be achieved. An additional advantage of the citric acid treatment is that it leaves no traces following decontamination, further reducing the risk of implant failure. Mono Blok adalah satu implan dengan diameter 3mm. Sistem ini menawarkan 2 pilihan prostesis, O-ball head untuk prosthesis penuh yang dapat dilepas serta abutment runcing untuk aplikasi Crown dan Bridge. Untuk lebih mengakomodasi persyaratan jaringan dan tulang lunak yang berbeda-beda yang ditemui di rahang atas dan bawah, sistem ini memiliki dengan 2 profil tubuh utama. Choice between square or O-ball head depending on fixed or removable applications. A tapered head with a 4,8mm height above the 3,1mm platform offers and optimal base and structure for the fixed reconstruction. MAN-OB/MAN-TAP smooth collar provides the platform switching height to accommodate the average mandibular gingival tissue. Augmented MAN-OB/MAN-TAP micro grooving for the increased cortical height of the mandibular bone. Low profile threading offers surface area yet with the reduced resistance necessary for placement in the D1/D2 bone that can be encountered in the mandible. Blasted and acid etched main body surface. Sharp apex to facilitate advancement in D1/D2 bone. MAX-OB/MAX-TAP micro grooving accommodates the thinner cortical bone that is encountered in the maxilla. Rounded tip is ideal for the maxilla so as to prevent the possible perforation of the sinus. Choice of tapered and O-ball head prosthetics. Sistem implan gigi Diameter Kecil adalah keluarga dari implan satu bagian dengan diameter bervariasi dari 1,8 mm, 2,1 mm, 2,4 mm dan 2,5 mm. Pilihan untuk setiap diameter adalah alur agresif, alur halus, kerah dan non – kerah, kepala bola O dan kepala persegi; menjadikan kisaran salah satu yang terbesar rentang implan gigi mini di pasaran. Sistem ini sangat ideal bagi para praktisi yang mencari solusi invasif minimal untuk menstabilkan gigi palsu berlebihan, ruang terbatas dan volume tulang serta kendala biaya pengobatan. The lower aspect of the implant collar is endowed with micro grooves to help maintain cortical bone. The fine thread SD implants are designed to facilitate the placement in hard bone. The implant surface is blasted with aluminum oxide and then subjected to progressive etching using citric acid. This surface treatment accelerates the osteointegration process by providing a greater and more uniform area of contact between bone and implant while favoring an immediate implant load. The top aspect of every collared implant is smooth so as to better accommodate soft tissue. The aggressive thread for SD Implants are designed for the added compression and surface area required in soft bone placement. C-tech provides SD models with and without gingival collars, allowing the practitioner to better address cases with differing gingival thicknesses. The anatomically shaped implants are produced from medical grade 5 titanium. Material purity starts with the acquisition of raw material from only the most reliable sources of which each lot is accompanied by its own material certificate and is completely traceable at all phases of production and later use. The production facility in which all the implants and components are made is owned and operated by C-TECH and is certified to the highest standards governing the production of dental/medical devices. To maintain these standards, regular and independent audits are performed by the German auditor, TUV Süd. All up to date certificates are available for download on the company website. 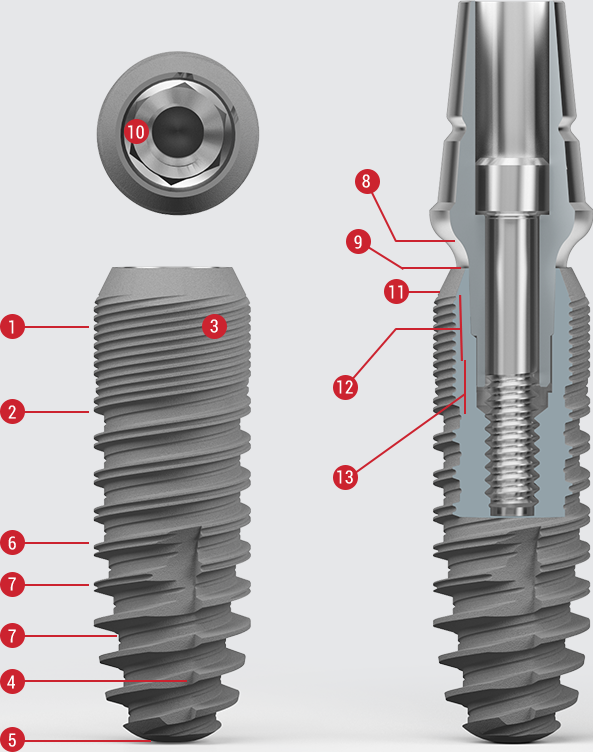 The machining of the EL implant is an intricate process due to the precision required for the Morse conical connection and the exterior complexity of the implant. This intricacy requires double the machining time that would be necessary for that of an average implant. Throughout and following each step of the production process, the implants are thoroughly cleaned in 5 seperate cleaning stages, consisting of a total of 20 cleaning cycles. This attention to cleanliness is in order to assure that no risk of any production residue is remaining on the implant surface. The surface topography is created through a patented acid etching process. The adjacent photos made with a scanning electron microscope (SEM) demonstrate the lack of impurities on the implant surface as well the abundant surface area created through the patented acidification process. The purity of the grade 4 titanium used for the EL implant and the surface topology were independently verified through an investigation carried out with a scanning electron microscope (SEM) by the University of Cologne and Medical Material Research Center of Berlin, Germany. The investigation demonstrated the highest level of purity and cleanliness resulting in the award of the BDIZ quality seal. This investigation is avaliable in its long form on the C-TECH website. The successful achievement of a Morse lock and cold weld seal in the implant-prosthetic connection depends on high precision machining. A perfect Morse connection will result in a structural integrity and strength that will be as if the 2 parts were fused together and thus will practically eliminate the gap between the implant and the abutment. Accordingly, the C-TECH components are machined to a tolerance of within 10 microns. This mechanical fusion of the prosthetic part and the implant has 2 important benefits; prevention of the bacterial colonization of the gap, which can lead to bone loss around the implant, as well as the elimination of micro-movements between the implant and abutment and the consequent screw loosening which can lead to prosthetic failure. The SEM photos on the right show different magnifications of the tight abutment and implant connection. The final photo at the bottom, at 1000 X magnification, shows a fine line where the abutment and the implant meet. This practically nonexistent gap is less than the 1,5 microns width of the bacteria to be found in the oral cavity. Dengan 4 rentang keluarga implan dari diameter 1,8 sampai 7,1, C – TECH menawarkan solusi untuk hampir segenap situasi implantologi. Solusi bedah tersebut dilengkapi dengan berbagai macam merk sendiri serta prostesis yang kompatibel. Semua produk C -Tech diproduksi dengan standar kualitas tertinggi yang mengatur produksi peralatan medis dan gigi Eropa.